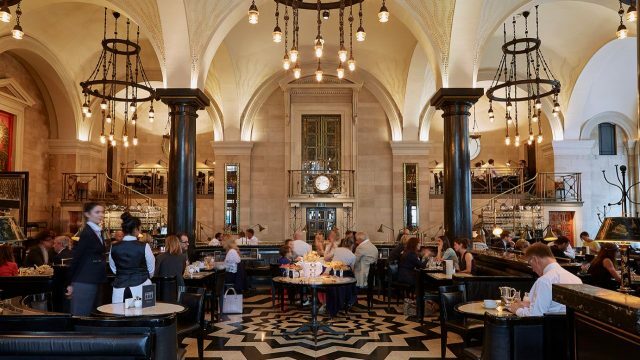 Another David Collins extravaganza, in 2003 The Wolseley was transformed by restaurant gurus Chris Corbin and Jeremy King into arguably London’s first successful grand café where diners flocked to people watch. Housed in a Grade II listed vintage car showroom-turned-bank on Piccadilly, the space was designed by architect William Curtis Green in 1921, who also put his hand to The Dorchester. Inspired by the grand cafés of Paris, Vienna and Budapest, Corbin and King kept many of the original features, including the gorgeous black and cream geometric marble floor, Baroque ironwork and Corinthian columns. An old station clock and dramatic black chandeliers with dangling lights add to its opulent charm.